Originally Submitted to FurAffinity.net on Aug 3rd, 2011 01:27 AM. Before it was transferred to Inkbunny it had 174 views and 13 favorites. This is a drawing of a Tengu warrior that I drew over the weekend. I figured it was time to draw some more characters from D. Dan's world and thought I drew another of his professors or teachers. The Tengu shown here is the one who taught him his swordsmanship skills. ^\/^. The clothing is likely not exact to that which is normally worn by the Tengu warriors of legend and, as such, I approximated as best as I can from memory. Though it is not accurate, it still looks cool in my opinion. LOL. ^\/^. And, just to note, he is a short character at about five feet in height. However, he is one of the finest swordsmen in the land and at an age of 134 has the experience to teach at the university that D. Dan received his advanced training from. His short height, light weight and high strength also make him a formidable and wicked fast and dexterous opponent to anyone. (Think of how Yoda was in the Star Wars film when he fought, only taller). LOL. ^\/^. At the university, students wear uniforms in accordance to their field of study. They tend to look like the typical uniform that they will eventually wear after becoming graduated and receive posts in the job of their choosing in relation to their degree. Professors at the university are not bound by the uniform code and wear as they see fit. 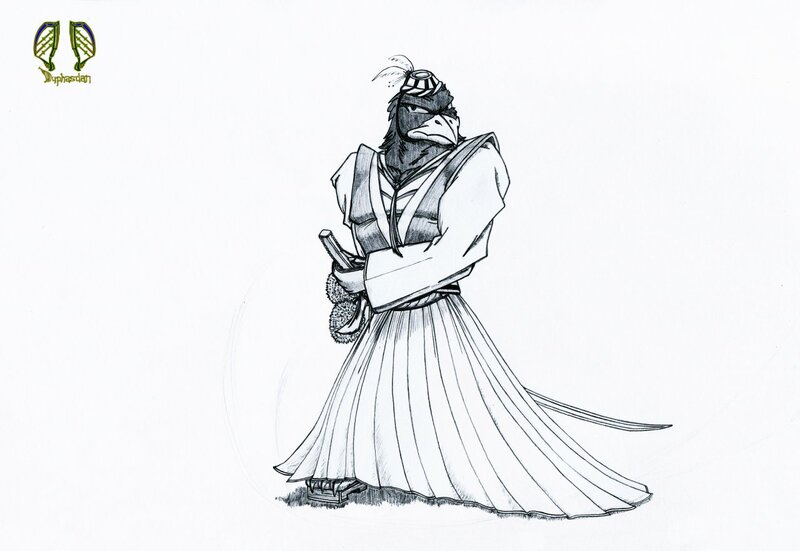 The Tengu warrior shown here is wearing his usual clothing for the day. ^\/^.